SAN JOSE, CA (Nov. 3, 2011) -- Addonics Technologies (www.addonics.com) today announced the RAID Tower XIII, which features thirteen 5.25 inch drive bays in a sturdy and stylish sheet metal chassis that can hold up to twenty 3.5 inch hard drives. The RAID Tower XIII is built on a sturdy steel chassis with a stylish acrylic front bezel. Each unit comes integrated with a 500 watts power supply and two 120 x 120 mm low noise high CFM cooling fans for efficient ventilation. Each set of five drives can be configured as a RAID group. You can connect 20 drives to your system via four eSATA cables, four USB 3.0 cables or a single mini SAS cable. For the USB connection, each RAID group can be shared on an LAN by attaching to an optional Addonics NAS adapter. 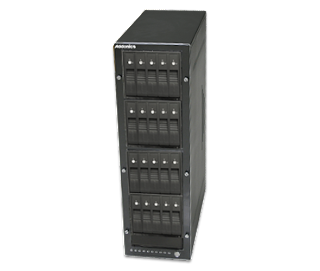 Addonics’ family of RAID Towers is a perfect solution for adding external RAID storage or a large number of hard drives without RAID to any system. 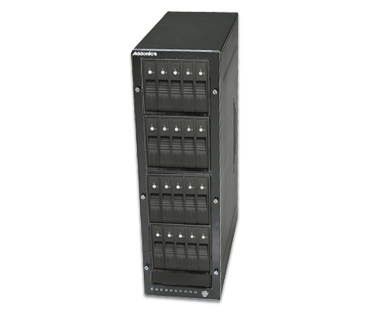 The RAID Tower XIII is ideal for a wide range of applications that demand large storage volume, such as video storage, data backup, server storage or cloud storage. There are five different models. Each model comes with everything needed for connecting to the computer. Simply add your own hard drives and configure the RAID via either the onboard dip switches or the included Windows software utility and your storage tower is ready to do the work. One model supports connecting up to twenty 3.5" SATA drives to a computer via four USB 3.0 or four eSATA connections. There is also a model that connects twenty 3.5” SATA drives via a single external mini SAS connection. On models integrated with four Snap-In Disk Arrays, hard drives can be added or removed like tape cartridges from each bay. No special tool is needed. Prices start from $ 965 for a model equipped with four Snap-In Disk Arrays and four eSATA connections. Addonics Technologies Inc. designs, manufactures, and markets a broad line of internal/external and mobile storage products. Addonics products are available through the company online store www.shopaddonics.com, major catalog companies, resellers, VARs and distributors, including Amazon.com, PC Connection, CDW, Buy.com, Provantage.com, Insight, and Ingram Micro.